This Greek pizza recipe is delicious and simple. This Greek-style pizza is great as a recipe for vegetable pizza. Greek-style pizza traditionally includes toppings such as feta, olives and other authentic Greek ingredients. 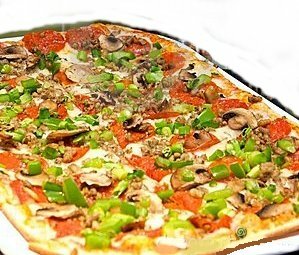 But this pizza is also known for having a thick, chewy crust, baked in a pan (similar to a Chicago deep dish pizza). A lot of people also use Phyllo dough for the crust. You can use whatever crust you like and top with typical Greek toppings like in the recipe below. Mix olive oil, garlic and 1/2 cup feta in a small bowl. 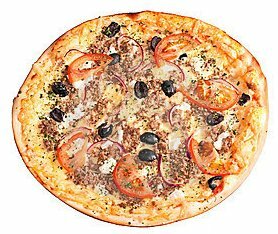 Place pizza crust on a cookie sheet; spread olive oil/garlic/cheese mixture over pizza, then top with tomatoes, olives and oregano. Bake until heated through and crisp, about 10 minutes. Toss spinach and onion with the 1 Tb. sun-dried tomato oil. Top warm pizza with spinach mixture and Mozzarella cheese. Return to oven and bake until cheese melts, about 2 minutes longer.